Twitter does include some location services, but they seem to be limited to setting the user’s current location rather than the location of each message. 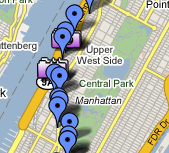 Also, a cursory look through Twitter’s API only revealed a granularity in location at the city level. A custom written Java program tries to match up messages and location using common time stamps, choosing the nearest match as necessary. The resulting data is exported as a KML (Keyhole Markup Language) file which can be viewed in Google Earth or plotted online using Google Maps. This is currently an off-line process, but it would be interesting to utilize the built-in GPS units of modern mobile devices to provide a real-time, on-line service for users to plot and view their location as they use Twitter. The prototype is called M5 Bus : Tweeted, which depicts a trip up the west side of Manhattan on the M5 bus as an assignment for NYU’s Interactive Telecommunications Program.